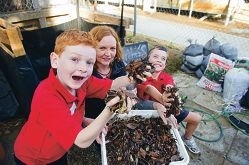 Mindarie Regional Council waste education officer Peg Davies visited Glengarry Primary School on May 13 to show 22 students and half a dozen parents how to make compost. Ms Davies said they made compost using paper, manure, food scraps and grass clippings, building up a pile of about 1 cubic metre, which they then covered and watered. She said the pile of compost would be ready to spread around garden beds in about eight weeks. Her visit promoted awareness of the benefits of compost and ways to create it.